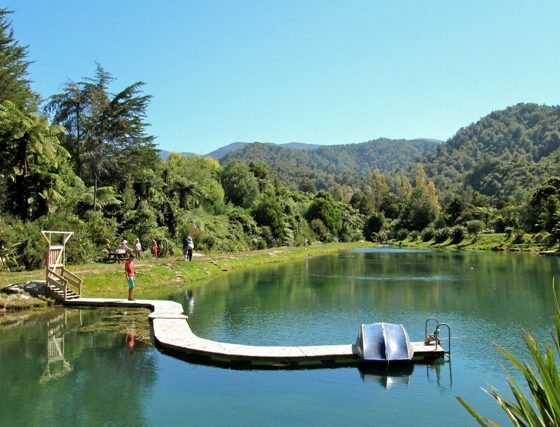 Located just 7km from Takaka township in the stunning Anatoki Valley, here you will find the ‘Anatoki Salmon Farm’ and a chance to feel the thrill of catching your own salmon, . 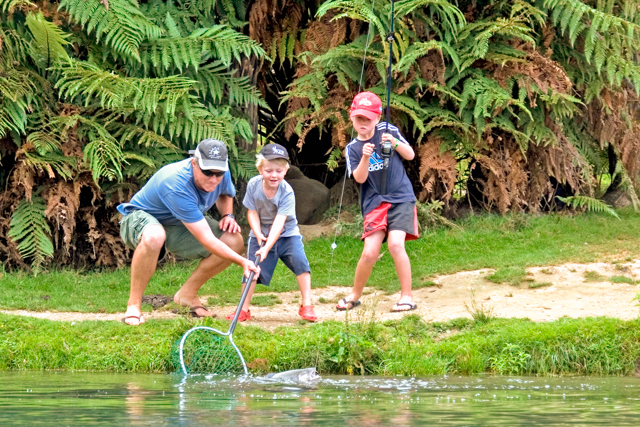 What could be more fun than a fishing session with your family or friends? 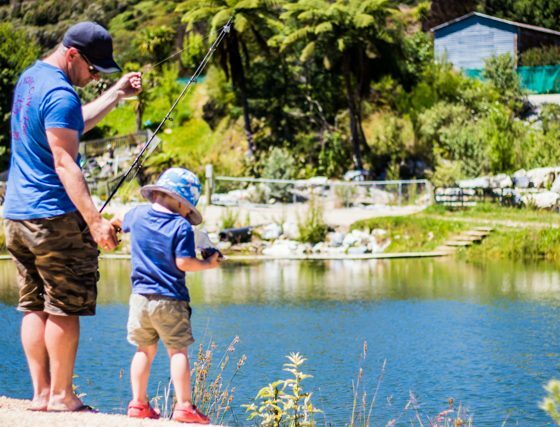 The farm is located next to Anatoki Tame Eels, so there are plenty of activities you can engage in after you’ve eaten your fish. Enjoy our fully licensed café. 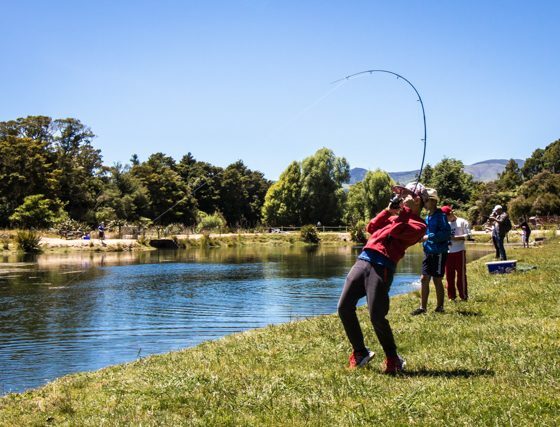 Watch salmon back-flip out of the water, listen as they splash on the surface, keep your eye out for the big one, feel the thrill as the salmon teases your line with nibbles just before you reel it in and land your catch. 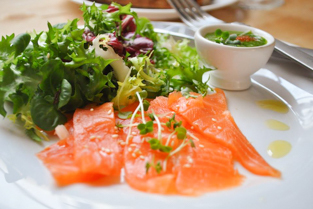 Enjoy your freshly caught salmon prepared as you like it in our cafe or take it away with you. 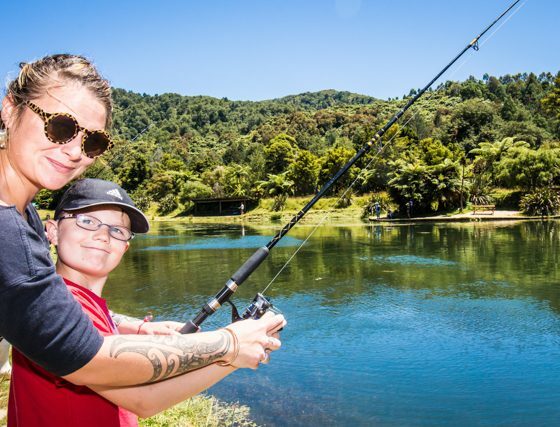 You don’t necessarily have to fish for yourself, of course. You can enjoy a glass (or a bottle) of high quality wine, sip a coffee or soft drink and select from their fully-licensed café menu – salmon-related of course. 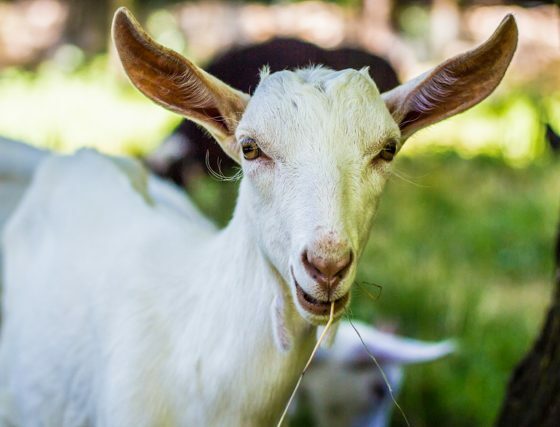 Have fun playing mini golf, a giant backyard game, or visit the petting zoo. 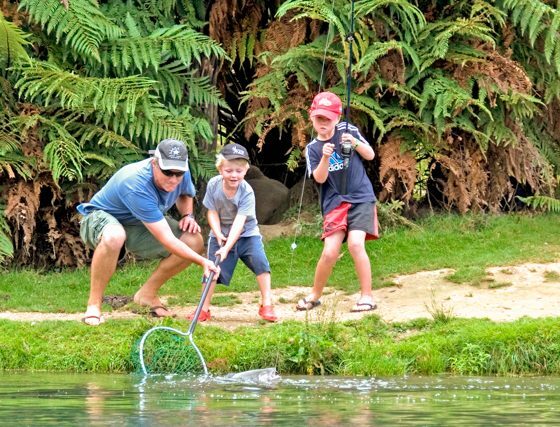 This tranquil spot adjoining the Anatoki River, looking out across beautiful New Zealand bush is the perfect location to bring your friends, family or on your own for a spot of fishing with guaranteed success. 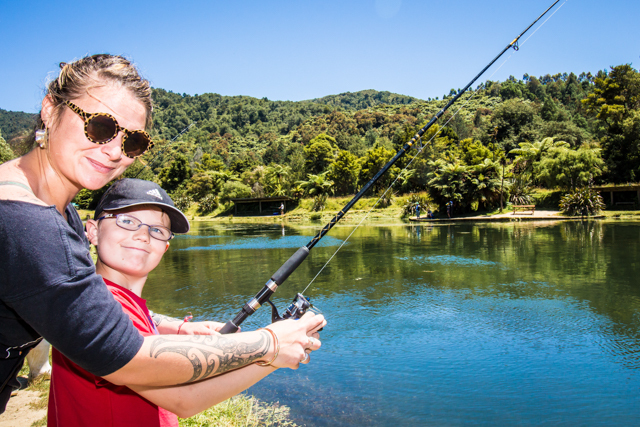 You don’t necessarily need fishing experience, entry is free and all the gear is provided for you free of charge. 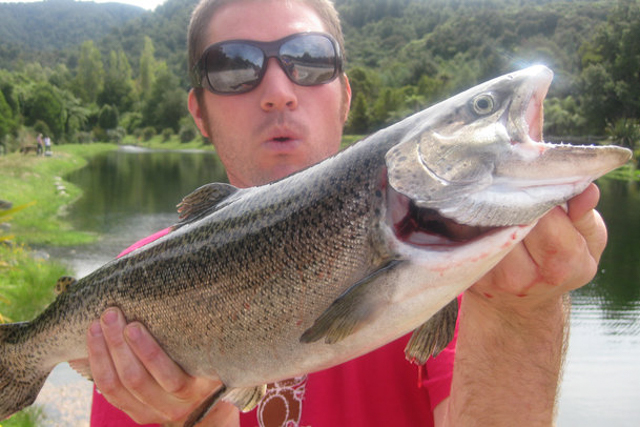 Simply pay per weight for what you catch, $24.00 per kilo. 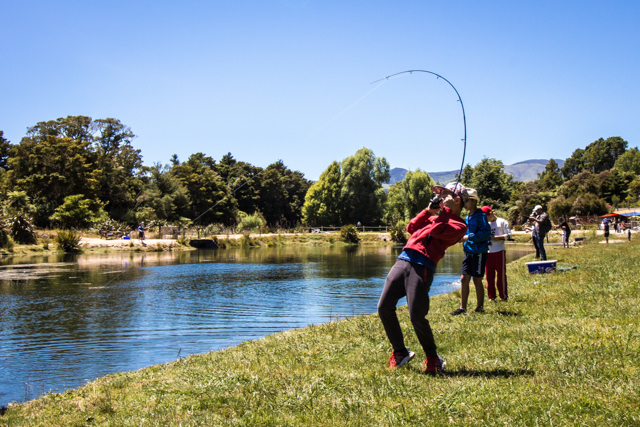 You will pick up your fishing rods and tackle from the café (after some instructions if needed) with a net and a bin to put your catch into, and head down to “Lake Anatoki”, the fishing pond.You can spend as long as you like down here catching your fish and enjoying the atmosphere.Your fish will then be cleaned and prepared in front of you, into fillets or steaks free of charge, or have it hot smoked on site for an extra $10.00 with a range of delicious seasonings. 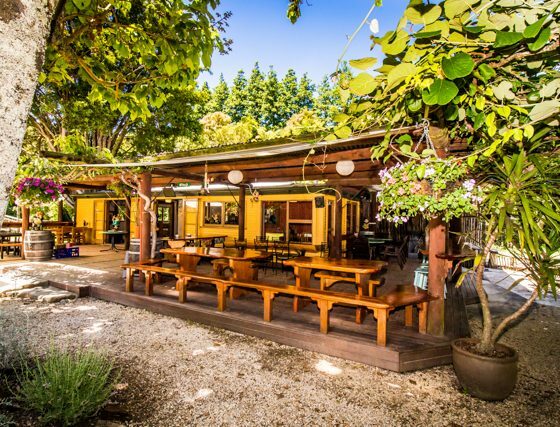 You can eat there as part of a picnic – there are plenty of spots for picnicking, or have it prepared to take home. It can even be vacuum packed for enjoying up to 30 days later! Or have it made into sashimi for just $8.00 per fish. They can also give you recipe ideas for if you’re taking your fresh fish home to cook yourself. 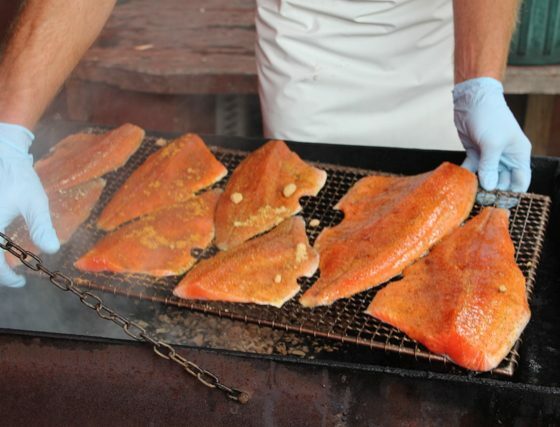 Just a heads-up – if you’re in a group of 10 people or more and are eating your fish on site, you will have it hot smoked for free and if you’re not here in Golden Bay and still want to sample their delicious salmon, you can contact us and make an order – with all salmon harvested and dispatched the same day. 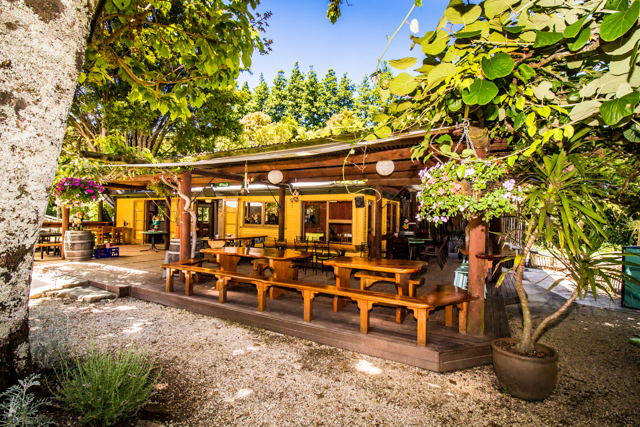 So, if your stomach is grumbling and you’re in the Bay with some time to spare, head to the Anatoki Salmon Farm for lunch, or the whole day. Open 9am – 4.30pm daily, no reservations required. 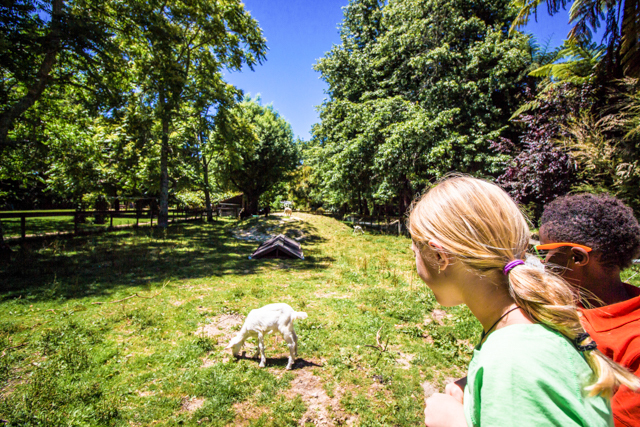 Experience the relationship between free wild creatures and humans, as you hand-feed them, just as Maggi McCallum first did over 100 years ago. 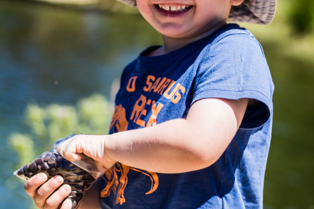 Buy your Eel food at the cafe for only $2.00, follow the bush trail for 5 minutes and feed the historic Anatoki tame eels. 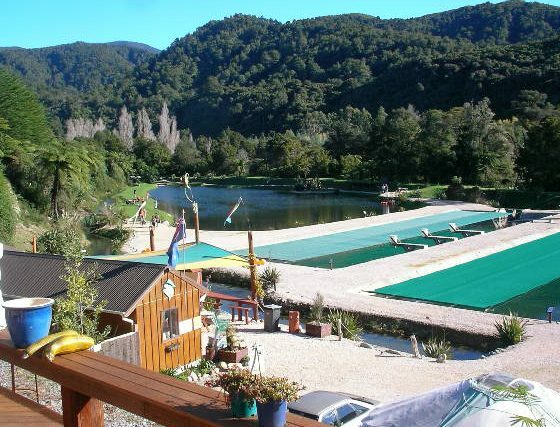 The salmon farm will be open year round The Eels will be closed over Winter because the Eels are hibernating. 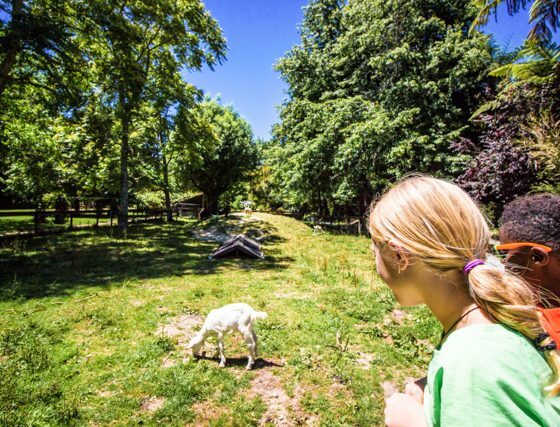 Outdoor Fun where you can go & play in one of the giant backyard games or spend time in the petting zoo with the friendly animals. 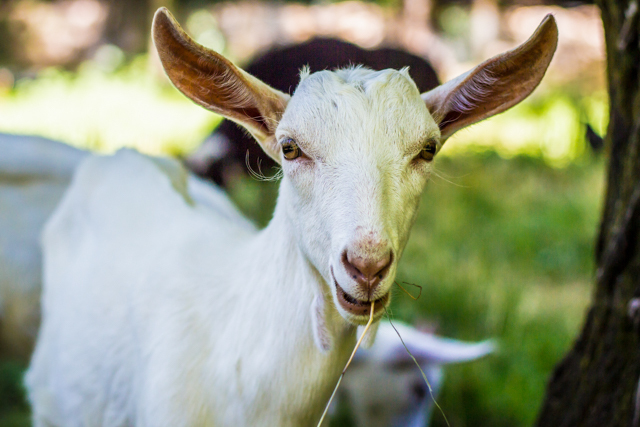 Have fun playing mini golf, a giant backyard game, or visit the petting zoo. Enjoy a delicious sweet or savory pancake in our café or just relax and enjoy the beautiful scenery. We are fully licensed and offer the best local beers, wines, and refreshments for your enjoyment. 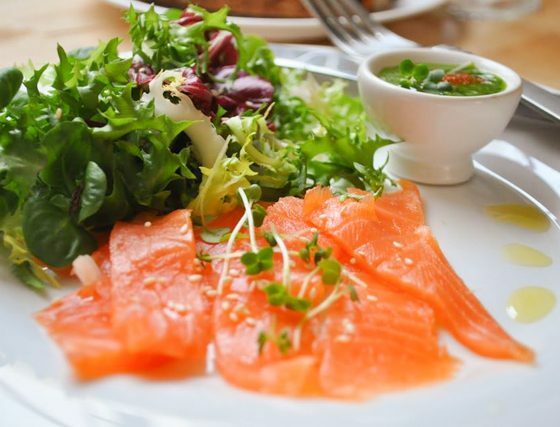 Besides the best pancakes in Golden Bay, we offer salads, sandwiches and a delicious salmon platter for two! 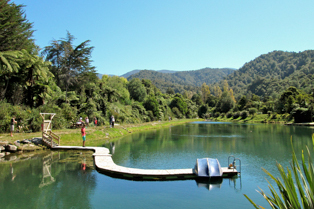 Most ingredients are obtained locally from Golden Bay or Nelson. 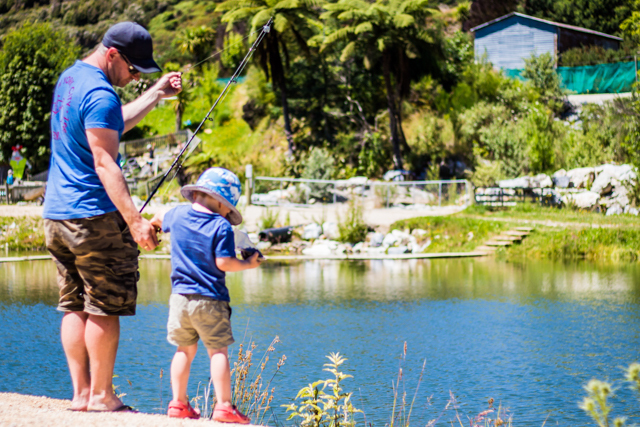 Enjoy the scenery with a drink while your fish is being prepared to perfection or go straight for our selection of salmon related quality meals and nibbles. The Cafe is fully licensed and the best local beer and wines are available for your enjoyment. 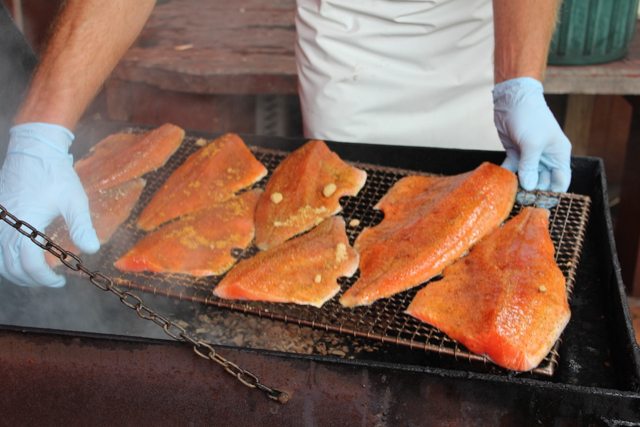 We also offer pre-packed Hot and Cold Smoked Salmon. 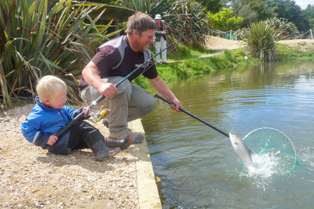 If you are after fresh salmon, take on the challenge of catching one yourself in our lake. All fresh Anatoki Salmon are harvested and dispatched within the same day, delivering a fresher, better quality salmon to your door. As aquaculture farmers neighbouring the Kahurangi National Park, we are uniquely privileged in employing the resources of the pristine waters of the Anatoki River. 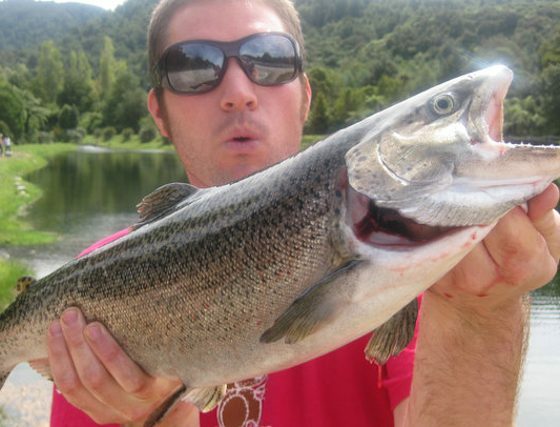 This enables us to serve you with exceptionally high quality fresh water salmon. 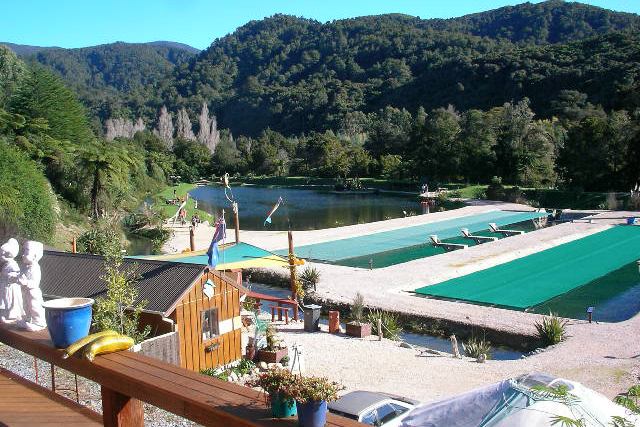 Anytime you are around Takaka, Golden Bay, and you want to eat good fish, just come to Anatoki Salmon Farm. We are open 9am-4.30 pm daily, and no reservations are required.